The AMRITA (Abolishing Morbidity by Regeneering and Integrated Technology Advancement) Initiative is RSI’s long-term strategy to develop and enhance the regenerative capacity of human beings to live healthier, disease-free lives and transform aging into a benign, beneficial process during which health and vigor are maintained. Aging results primarily from reversible loss of epigenetic/epigenomic information with cell divisions and with chronological time and absence of sufficient regenerative mechanisms to repair the inevitable damage that results to homeostasis. The key to differences in longevity among mammals is varying fidelities of the biomolecular machines that maintain the epigenome, and the degree to which they retain mechanisms to regenerate damaged and old tissue. AMRITA is developing methods to restore a youthful state of the epigenome and enhance regeneration. AMRITA is the logical next step for regenerative medicine– to engineer enhanced regeneration into human beings. What is aging? Aging results primarily from the reversible loss of epigenetic/epigenomic information with successive cell divisions and with chronological time and the absence of sufficiently powerful homeostatic and regenerative mechanisms to maintain somatic tissue integrity. The key to differences in longevity among mammals is due to the varying fidelities of the biomolecular machines that maintain the epigenome and differences in regenerative and homeostatic capacity. Absence of mechanisms to adequately control aberrent proliferation (cancer), remove and replace old cells and biostructures is also explanatory. The most widely accepted idea that aging is accumulated “damage”, is unsatisfactorily vague and misleading. Accumulation of waste biomolecules and loss of key cells only play a role late in the aging process. Rapid development of biotechnology, synthetic biology (Biotechnology 2.0), micro- and nano-technology, coupled with accelerating gains in knowledge of how biological systems function, and taking advantage of the tremendous advances in machine learning and artificial intelligence make AMRITA possible. Closely integrated with our innovative education projects, the AMRITA Initiative is divided into three parallel tracks. The first track is identifying ways to slow or reverse aging in the immediate future by using artificial intelligence and machine learning approaches in systems biology and targeted research to identify aging pathways amenable to intercession. The second track develops the technology to reprogram human cells and tissue in vivo to effectively rejuvenate (rejuveneer) them, based on breakthroughs in understanding regeneration and stem cell biology. Our own cells and tissues will be reprogrammed to: 1) undergo cycles of rejuvenative cell division when necessary, 2) remove old dysfunctional cells, and 3) replace them with rejuvenated youthful cells. Increased regenerative power will be a beneficial side effect. In the third track, micro- and nanotechnology are being developed to create biological automatons (biomatons) and robots (biobots) that will be able to repair and remove damage throughout the body and effectively complement the pure biology based approaches. The main goal of Track 1 is to slow and when possible partially reverse the aging process. Achieving this end requires identification of the specific pathways of biological disorganization that accompany aging. Recent research in aging suggests that fundamental instability in the maintenance of the differentiation state and function of somatic (body) cells in animals leads to specific series of defects, some of which can be blocked or even reversed. Although it has long been known that irreversible changes resulting from physical damage to biomolecules do occur during aging, most of these changes occur quite late. The most serious irreversible changes involve loss of key cells, including progenitor and stem cells. Interceding before such irreversible changes like stem cell death occur, will slow or prevent dysfunction, and thereby prolong lifespan. Research to predict key points of intervention using a machine learning and artificial intelligence approach to systems biology is ongoing. Laboratory experiments to confirm these predictions will be followed by identification and development/engineering of agents to intervene. The fruits of this work will increase health and longevity in the short term, while waiting for the maturation of Track 2 and Track 3. Our current focus is to identify aging specific epigenetic signatures in human cells in culture and determine if they can be reset to a younger signature using small molecule drugs, cytokines and growth factors that affect regenerative processes by modulation of the Wnt pathway, neuregulins, bone morphogenic proteins, and CAS9-directed epigenomic regulators that we have engineered to modify specific regions of the epigenome. “Rujeveneering” is the potentially game-changing bioengineering discipline where synthetic biology meets stem cell biology which will advance human health and longevity, beyond the development of good public health practices, vaccines and antibiotics. Rejuveneering uses synthetic biology and advanced biotechnology to genetically reprogram cells. The advent of easily engineered gene editing and targeting technologies using CRISPR/Cas9 and Argonaut make possible complex epigenomic engineering among other possibilities. 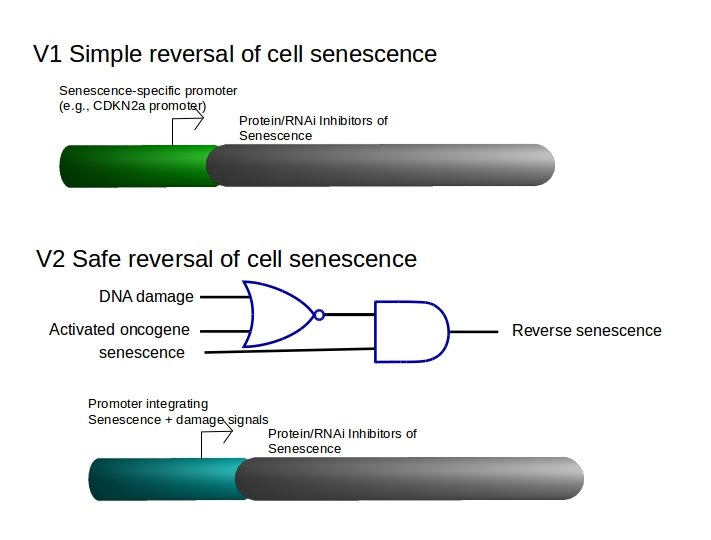 Focus is on 1) development of synthetic biology circuits to effect desired change to pre-existing cell differentiation and repair programs to enable cells to 1) recognize, 2) remove or reprogram old dysfunctional cells and 3) stimulate progenitor cells to undergo rejuvenative cell reprogramming/divisions to effect replacement. The second focus of Track 2 is on safely delivering “wetware” to human tissues and cells: DNA, RNA and proteins to targeted cells in vivo to modify cell function using engineered extracellular vesicles. Specialized cell reprogramming to rejuvenate cells is perhaps the most significant of the AMRITA projects. Determining precise cellular changes necessary to reset the epigenome to eliminate dysfunctional changes and loss of regualtory information caused by epigenetic drift and entropy will enable development of novel therapies to treat aging and its associated pathologies. Engineered synthetic biology circuits to reverse or eliminate cell senescence, a special non-dividing cell state that interferes with the function of differentiated cells, are under development. The key is to eliminate irreversibley damaged senescent cells, “senolysis,” while rescuing undamaged pre-senescent or senescent stem cells that are needed for regenerative processes. It is the loss of stem cell function with aging to senescence and to cell differentiation that is particularly problematic. The problem: Evolution has not resulted in the development of ways to effect ALL of the needed biological repairs to maintain homeostasis for more than 100-120 years. It should be possible to harness cell reprogramming of differentiated cells to effectively rejuvenate them. However, not all tissues in humans and other animals have mechanisms to maintain homeostasis. For example, the lens of the eye is acellular. With time, oxidation reactions cause protein cross linking in the eye that result in cataracts. Although it will eventually be possible to reprogram cells to create a new lens using a modified version of the innate eye developmental program, removing the old lens is a more difficult task which requires creating a new developmental program de novo. It is far simpler to remove the old lens first physically, as is done today with cataract surgery, and then replace it. An even more serious problem is cancer, incidence of which is tied to increasing age. Tumor cells can rapidly mutate to develop resistance to single and multidrug therapies, while avoiding culling by the immune system. Aggressive late stage tumors are mostly incurable because they can rapidly evolve resistance to any single therapy. The solution: A potential solution is to develop automatons and robots that work to effect repairs of biologically intractable tissue, perform microsurgery when needed and destroy cancer cells as they arise. Simpler micro biological robots (biobots/ microbots) and nano biobots have already been constructed by others. DNA-based robots that change conformation to deliver a “drug” after interacting with a specific protein target have already been reported. Various biobots between 1 um and 1 mm in size have been developed with varying degrees of self-propulsion– movement is controlled by magnetic fields, light, chemical gradients, etc. The AMRITA project is developing biobots and biomatons to act as smart devices within the body: active micro surgeons with biosensor and biosynthesis capability. Our approach is focused on chimeric devices built from a combination of biological and artificial components created by 3D printing. These biobots are being designed to solve the more intractable issues in rejuvenation, such as removing oxidatively damaged lens proteins in the eye and then synthesizing new crystallins, the key components of the lens. Heart valve deterioration with age is usually treated with procedures that involve open-heart surgery — biobots potentially can be used to perform such surgery without stopping the heart. Cancer will finally be widely curable: biobots will designed to interact with cells throughout the body, probe intracellularly for cancer signatures and then destroy or inactivate the cancer cell. AMRITA recognizes the outstanding work of scientists throughout the world and intends to integrate our program with key discoveries and technologies as they are reported. Collaboration on exciting work of relevance to AMRITA are enthusiastically welcomed. For example, we currently have an exciting collaboration in place on engineering extracellular vesicles with researchers at Brown University. The AMRITA project has two divisions at RSI: the AMRITA in silico division and the AMRITA wetware laboratory division. The AMRITA in silico division works on all three tracks of AMRITA using machine learning and artificial intelligence. Track 1 uses pathway analysis and epigenetic data of aging to predict potential points of intervention. Because it is difficult to extract key regulatory interactions using standard methods, machine learning has been increasingly applied and is a special focus of RSI. Track 2 uses in silico analysis to understand how to design cells that can repair and regenerate damaged and dysfunctional tissue associated with aging. In Track 2, circuits to reprogram cells are designed using simulations using differential equations and computer-based evolutionary algorithms, a branch of AI. Track 3 uses molecular and cellular computer-aided-design (CAD) approach to design the microbots and is the least developed, but most exciting work at RSI. The AMRITA wetware division is focused on basic research and the development of key technologies needed for all three branches. Tracks 2 and 3 in particular require significant wetlab work, which requires specialized training in molecular and cell biology as well innovative skills to develop new synthetic biology methods. In particular, Track 3 requires wet-lab engineering and 3D fabrication techniques. Help support the AMRITA project transform aging into a benign process and eliminate chronic diseases!